To say that the 2017 NFL Draft, held in my hometown of Philadelphia over the last three days, was a major success would be an understatement. I got to experience this signature event of the National Football League up close and in person as a Sergeant with the Philadelphia Police Department. It was just the latest in a number of high profile events that I've had the pleasure to enjoy while on-duty during my career. 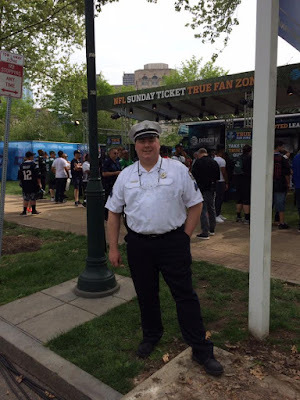 Assigned to take charge of a group of police officers, we spent both days on the south side of the 2400 block of the Benjamin Franklin Parkway. It was a slight surprise to me when my group actually took that position and found that we were at the very front lines of the stage and seating arena area. It turned out to be an exciting and rewarding assignment. The crowd was massive, but Philly-friendly and cooperative. As far as their interactions with myself and my officers, I couldn't have asked for a more positive reception. Everyone was friendly to us and appreciative of our efforts, and quite a few let us know that fact. One thing that none of us knew, from the top brass on down to rookie police officers, was exactly what kind of crowd we would be met with. It was the first time that the NFL had put on their annual Draft of college players in that big of a show. Philly can be notorious at times for our fan reactions, especially where Eagles fans are concerned. You also had to add in the factor that this was a free event. Would the crowd turn surly at any point? Sometimes it only takes a few bad apples to spoil things for the whole bunch. If any officials held any concerns of a worst-case scenario, those never materialized. In fact, just the opposite. Even when faced with moments involving the hated, rival Dallas Cowboys, New York Giants, or Washington Redskins, the Philly faithful responded with spirited but controlled reactions. The biggest target of the 'Boo Birds' over the first couple of days was easily the Commissioner of the NFL, Roger Goodell. Yet even with the Commish, I witnessed first-hand a somewhat different reaction from the crowds. The Philadelphia Phillies powered their way past the Miami Marlins by a 7-4 score on Wednesday night at Citizens Bank Park, tying the Fish for second place in the NL East standings. The Fightin’ Phils used three home runs, including a grand slam from Maikel Franco‘s suddenly percolating bat, to rally from an early 2-0 deficit. Vince Velasquez provided manager Pete Mackanin‘s club with a tidy 6.1 inning effort. He allowed six hits and three earned runs in a 97-pitch outing. Velasquez also struck out three and walked two batters in registering his first victory of the season. The win was a fifth consecutive victory for the Phillies, moving the team above the .500 mark at 10-9 as we approach the end of the first month of the 2017 MLB season. Exactly one year ago on this date, the Phillies were also a game over that .500 mark. At 11-10, the Phils would continue to rise in the standings over the next three weeks. They would reach a high-water mark for the 2016 season of 24-17 on May 18th before it all came crashing down. While that fast-starting Phillies season of a year ago deteriorated into a fourth straight losing campaign, there are signs that things may turn out differently this year. To say that the 2016 season was rough for the Tampa Bay Rays and their fans would be an understatement. The club’s 68-94 last place finish in the AL East was their worst in nearly a decade. From 2008, the year that a talented, young Rays club won the franchise lone American League pennant, through 2013, Tampa Bay won 90 or more games in five of six seasons. But it has now been three straight losing campaigns in west-central Florida. And most prognosticators had the team again finishing at the bottom of the standings. But the Rays are off to an encouraging 9-9 start here in the early weeks of the 2017 season. It hasn’t been any one particular thing either. Under third year manager Kevin Cash, there has been real improvement across all facets of the game. Those improvements added up to a winning record after the Rays swept the Detroit Tigers earlier this week for the first time since 2010. A loss last night to Houston dropped the club back to the .500 mark. The Los Angeles Angels are off to a 7-10 start to the 2017 season. Those uneven first three weeks have the team tied with the Seattle Mariners for third place in the AL West Division standings. Those two clubs are just a half-game ahead of the last place Oakland Athletics. One of the main reasons that the Halos remain closer to the bottom of the division than the top is the continuing struggle to find support for the lineup’s lone true superstar. Mike Trout appears set to add yet another strong season to what might already be a Hall of Fame career. Turning 26 years of age just before the MLB All-Star Game this coming July, Trout is hitting for a .339/.424/.625 slash line over the season’s first three weeks. Trout has thus far produced three home runs, 11 RBI, and seven runs scored while stealing three bases. Those numbers put him on pace for the second ’30-30′ season of his career, which is now in its seventh year. But even with a player of this caliber in their lineup, the Angels still struggle. A two-time AL MVP who has been the runner-up for the award in each of his other three full seasons. Five straight Silver Sluggers and AL All-Star nods. And still the team cannot win consistently. Heading into Thursday night action in Major League Baseball, the Arizona Diamondbacks are tied atop the National League West Division standings with a 10-6 record. This comes one year after a disheartening 69-93 campaign for the Dbacks. Last season found Arizona avoiding the division cellar by just a single game. The biggest offensive contributor in the lineup thus far has been third baseman Jake Lamb. The 26-year old is now in his second season as a full-time starter. A native of Seattle, Lamb was the Diamondbacks selection in the sixth round of the 2012 MLB Amateur Draft out of the University of Washington. The 6’3″ lefty-swinging Lamb achieved success in the minor leagues between 2012-14. In doing so, he became a Top 100 Prospect as ranked by both MLB and Baseball America prior to the 2015 season. The Saint Louis Cardinals, perennial National League contenders, are off to an uncharacteristically slow start this season. The team is currently sitting at the bottom of the overall National League standings with a 4-9 record. Saint Louis has won an NL-record 11 World Series championships. In addition, the franchise has won 19 National League pennants. The club has captured 13 division crowns, including 10 in the NL Central, and has been an NL Wildcard playoff team on three occasions. In recent years, Saint Louis has finished in either first or second place in the NL Central for eight straight seasons. They won the division four times in that span, reached the Fall Classic twice, and won the 2011 World Series. While the longtime arch-rival Chicago Cubs ran away with the division a year ago, finishing 17.5 games in front of the Cards, that was more a reflection on the Cubbies dominant year. The Cardinals went a solid 86-76 in the 2016 season, and fell just one game shy of both the New York Mets and San Francisco Giants in the race for another postseason berth. This book review resumes my series on baseball books during the 2017 season. Previous reviews can be accessed by clicking on that "label" below this piece. There is no book that I have read in recent years that I can more highly recommend than “Ahead of the Curve” by Brian Kenny. Kenny is a 2003 Emmy Award winner who was named as the 2004 Media Personality of the Year by Sports Illustrated. He is now well-known by baseball fans as a studio host for the MLB Network. In addition, Kenny is respected as a boxing analyst and broadcaster. A longtime ESPN anchor and analyst, Kenny left in 2011 for the television stint with the then two-year old MLB Network. He also hosts ‘The Brian Kenny” show weekdays on NBC Sports Radio. With his new TV gig, Kenny also joined former player Harold Reynolds on the ‘MLB Now‘ program. The show is highlighted by Kenny espousing modern “Sabermetric” statistical analysis of America’s Pastime. Those Sabermetric views make up the centerpiece of “Ahead of the Curve“, which comes with an “Inside the Baseball Revolution” sub-title. The Philadelphia Phillies have been undergoing a public rebuilding program for the last two to three years. Management has made some astute trades. They have also done a solid job making selections in the annual Major League Baseball Amateur Draft. It all adds up to the Phillies accumulating an enviable array of minor league prospects. Some of those players have already begun their big league careers. This is most especially noticeable on the mound, where starting pitchers Jerad Eickhoff, Vince Velasquez and Aaron Nola are each now in their second full big league season. And even more are just a phone call away. The Phillies top farm club, the AAA Lehigh Valley IronPigs, are roughly a 60 miles north drive up the Pennsylvania Turnpike in Allentown, PA.
Based on MLB.com rankings, a full seven of the Phillies top dozen prospects, including three of the top four, are starting this season with the Pigs. The Philadelphia Phillies announced today that a baseball legend will become the 39th honoree on the Phillies Wall of Fame. 1980 World Series hero Pete Rose will be enshrined in a ceremony that will take place on Saturday, August 12, 2017. The ceremony will take place prior to a game against the division rival New York Mets. On that night, numerous Phillies greats of the past who have been honored previously will return to take part in the ceremony. There they will welcome “Charlie Hustle” to the ranks of Phillies immortals. Rose was one of 10 former Phillies greats who were originally nominated for the 2017 Wall of Fame slot. Fans of the team voted online at the start of the year from among 10 nominees to determine three finalists. It appeared during the 2015 season that fans of the Detroit Tigers just might be witnessing the beginning of the end of the brilliant career of ace starting pitcher Justin Verlander. Verlander had won the 2006 American League Rookie of the Year Award and the 2011 AL Cy Young Award. He had also been a six-time American League All-Star at that point. He was a key member of the rotation in that rookie 2016 season as the Tigers won their first American League Pennant in nearly two decades. In 2012, Verlander was the ace of the staff as Detroit won another AL Pennant. The Tigers have either won the AL Central Division or finished second in nine of 12 seasons since Verlander fully joined the rotation. In 2015, Verlander opened the season on the Disabled List. It was the first-ever appearance on the DL in his Major League Baseball career. A right triceps strain put an end to seven consecutive seasons as the Opening Day starter for the Tigers. Finally able to return in mid-June, Verlander pitched well over the remainder of the season. But the Tigers finished in last place, just the second time in his career that had happened. Verlander had seen his ERA rise from a 2.64 mark in 2012, a year in which he finished as the runner-up in the AL Cy voting, to 3.46 in 2013. It then rose again to the 4.54 mark in 2014. His strikeout numbers, K/9, and K:BB ratio dropped each year. The Washington Nationals finished at the bottom of the NL East standings in the 2010 season. It was a familiar finish for the former Montreal Expos franchise. The team had ended the season in last place in four of the previous five years since relocating south to the U.S. capital city. That 2010 campaign wrapped up the third season for the team at Nationals Park, and team management was looking to turn around the fortunes of the franchise. During the off-season, GM Mike Rizzo looked over his youthful roster and believed that he saw things about to change. Players like Ryan Zimmerman, Ian Desmond, Stephen Strasburg, Jordan Zimmermann, and Danny Espinosa were beginning to emerge. In June, the club picked at the top of the MLB Amateur Draft, selecting mega-hyped teenager Bryce Harper. Rizzo saw the beginnings of better days ahead in the near future. But he wanted a veteran, proven, run-producing bat to help the club take the next step. Just in time, star right fielder Jayson Werth of the division-rival Philadelphia Phillies was becoming a free agent. The Philadelphia Phillies spent roughly six weeks down in Florida for spring training this year. And for a second straight spring, Vince Velasquez demonstrated power pitching in the Grapefruit League. Last year, Velasquez was competing to become the team’s 5th starter. He pitched so well that awarding him that role right out of 2016 spring training was an easy decision for manager Pete Mackanin. This year, Velasquez dazzled once again. Over five spring starts, the right-hander allowed just 12 hits over 19.7 innings with a 25/9 K:BB ratio. He registered a 2.75 ERA and a 1.07 WHIP, with opposing batters hitting just .171 off him. Those nine walks, however, are still a bit too high. But the other numbers continue to reveal his dominating stuff. Velasquez has a chance to pitch at the very top of the Phillies rotation in the next few years. Of course, his continuing command and discipline issues, and the development of other options, could force him to a high-leverage bullpen role just as easily. In many ways it was a rewarding 2017 Opening Day performance for the Philadelphia Phillies and third baseman Maikel Franco. The team came out on the winning end of a 4-3 score at Great American Ball Park against the host Reds on Monday afternoon. Franco contributed with a hit, a walk and a run scored. But in another way, Franco’s performance was a bit of a letdown. As the Phillies’ cleanup hitter, he is expected to drive in runs. On Monday afternoon, Franco left four runners on base. It’s only one game. Franco could well prove to be the big-time run producer that the club needs him to become. And make no mistake, they do need him to realize all of his vast potential. If he doesn’t, if Franco is only a marginal player with some pop, it would be a setback to the Phillies’ carefully planned rebuilding program. At 7:10pm on Tuesday night at Tropicana Field, the New York Yankees will send their veteran 36-year old left-hander to the mound. CC Sabathia will be trying to help the club to its first victory of the nascent 2017 season. The host Tampa Bay Rays ripped the Yanks by a 7-3 final in Sunday’s season opener. For Sabathia, this will be his 17th season in Major League Baseball. The first-round pick at 20th overall in the 1998 MLB Amateur Draft by the Cleveland Indians, he spent most of his first eight seasons with the Tribe. He was a three-time AL All-Star with Cleveland. In his final full season there, Sabathia won the AL Cy Young Award. Sabathia was dealt to the Milwaukee Brewers at the 2008 trade deadline and helped the Brew Crew to an NL Wild Card berth. Following that ’08 season, Sabathia signed a huge nine-year, $202 million free agent contract with the Yankees. His first season in the Big Apple resulted in the Yankees winning the World Series. Sabathia finished fourth in the Cy Young voting. In each of the subsequent two seasons, Sabathia again finished within the top four of the AL Cy Young race. He was an AL All-Star each year from 2010-12.